Hamburg is one of Germany's main rail centres with a busy S-Bahn, loco-hauled regional passengers in all directions, many InterCity and ICE services and lots of freight. This gallery barely scrapes the surface. Bremen is a major commercial, industrial and port city and a busy rail centre. The city's main station, Bremen Hbf, is quite photogenic with frequent freights running through, underneath a fine overall roof. The Hamburg - Westerland line is also known as the Marschbahn and runs through the low-lying flat countryside of Schleswig-Holstein. It's a very traditional railway in many ways with loco hauled trains and semaphore signals and hosts an unusual car-carrying operation between Niebüll and the island of Sylt over the Hindenburgdamm, one of several notable civil engineering features. Freight traffic is usually sparse but my visits coincided with the diversion of freights from the parallel electrified main line further east. The Niebüll - Tønder line is normally a quiet backwater hosting the occasional cross-border DMU between Germany and Denmark but for two three week periods in the summers of 2014 and 2015 it was used as part of a diversionary route for international freights hauled by class 232 and 233 diesels. The Hoyerswerda - Horka line was a classic rural railway in 2010; single track with passing loops, semaphore signals, telegraph poles a sparse passenger service and a handful of diesel hauled freights. It closed shortly afterwards for conversion into a double track, electrified freight corridor and has yet to reopen. The Schöna line runs up the scenic Elbe Valley from Dresden to the Czech border and is part of a major trunk route linking Slovakia, Hungary eastern Austria and the Czech Republic with Berlin, Hamburg and Scandinavia. Czech locos can be seen on long distance freight and passenger trains and, at the time of my visit, local passengers were worked by DB class 143 electrics. The Harzer Schmalspurbahnen operate a 140km network of metre gauge lines in the Harz Mountains including a branch to the summit of the Brocken, at 1142m a.s.l., the highest point in northern Germany. A good proportion of trains are still worked by a fleet of 2-10-2 tank engines and the line retains a lot of the character it had when it was part of the DR system. Hannover is a major regional centre in northern Germany with its own suburban rail system. It's also an important railway centre where major routes from Berlin, Hamburg, Bremen, the Ruhrgebiet and the south converge, all with heavy passenger and freight traffic. What the area lacks in scenery, it makes up for with the quantity and variety of motive power. The line from Koblenz to Wiesbaden along the right/east bank of the Rhein (Rechte Rheinstrecke) is one of Germany's busiest freight arteries and very scenic as well. Most of DB's freight electrics can be seen along with the locos of numerous independent operators and, occasionally, diverted ICs and ICEs. The Koblenz - Mainz main line along the left/west bank of the Rhein was traditionally one of Germany's main north-south passenger routes but lost most of its InterCity traffic when the Köln - Frankfurt NBS opened. There are still hourly InterCity trains, loco hauled RE services and more freights than in the past. Add some superb scenery and a few mediaeval towns and the photographic potential becomes obvious. This double track, diesel-worked, main line is one of Germany's oldest, dating from the 1840s. It runs through the attractive Vogtland landscape, winding around rolling hills and crossing a couple of spectacular viaducts. Most passenger trains were DMUs but there were a few loco hauled passengers and a handful of freights when I visited in October 2010. The line has since been electrified. The Bebra - Fulda line runs along Haunetal, a beautiful river valley flanked by rounded, forested hills and dotted with small farming villages. The railway is a double track electrified main line and a vital link between northern and southern Germany. Freight traffic is heavy and varied and there were regular loco hauled passengers as well when I first visited in 2006. The electrified double-track main line through the Mosel Valley is busy, scenic and relatively easy to reach from the UK. In 2011 it was also home to the increasingly rare class 181 electrics and saw a good variety of locos from DB and other operators on passenger and freight. This single-track, electrified route runs along Neckartal on the east side of the Black Forest and carries class 146 hauled REs and class 185 hauled freights. Continuing problems with the tilting ICEs led to a return to loco haulage of InterCity trains in late 2009 with classes 101, 115, 120 and 181 all appearing on Stuttgart - Zürich services. The Stuttgart - Ulm route is a busy double track electrified main line linking the Rhein-Main conurbation and Stuttgart with München and Austria. Like many German main lines it carries a wide variety of traffic hauled by a wide variety of classes. 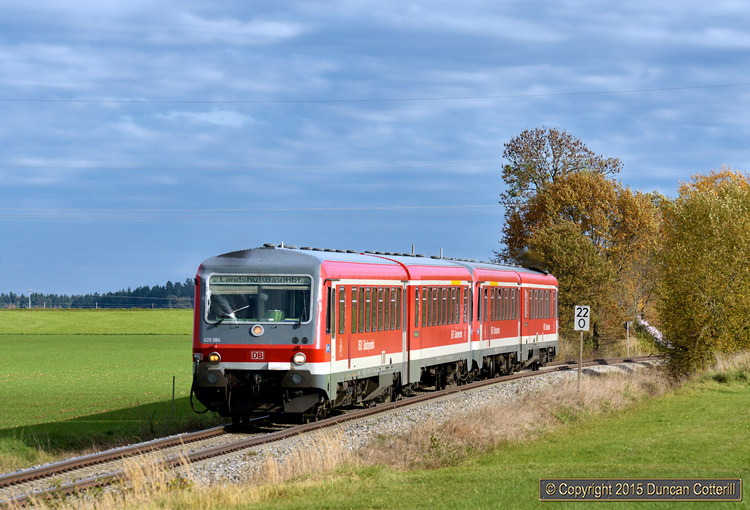 The Südbahn, not to be confused with the Austrian Südbahn, runs south from Ulm to Friedrichshafen via Biberach and Ravensburg and is double track and diesel worked. Some services are DMUs but there are plenty of class 218 diesels on passengers and the occasional 232 or 294 on freight. The scenery isn’t spectacular but there are some very nice positions on the southern half of the line. The valley of the River Main provides a convenient route for traffic from Frankfurt and northern Germany into Bavaria. Like the Bebra - Fulda line, freight traffic is heavy, the scenery is attractive and the passenger trains are loco hauled. Most of Railion's electric locomotive classes can be seen at work here along with diesels and electrics belonging to open-access operators. UPDATED with additional images from 2006 and 2009. A quiet double track unelectrified line running through the attractive countryside of north-eastern Bayern but still seeing some loco hauled passengers and a few freights. These photos were taken on two visits in 2013. The Nürnberg - Hof line is part of a network of diesel worked routes running through hilly country north and east of Nürnberg to the borders of the Czech Republic and the former DDR. Passenger services are worked by DMUs but there are also a number of freights hauled by ex-DR class 232 locos. The line runs through some very attractive scenery with plenty of bridges and tunnels in the Pegnitz Gorge between Vorra and Neuhaus. The Hersbruck - Schwandorf line is part of a network of diesel worked routes running through the attractive hilly country north and east of Nürnberg to the borders of the Czech Republic and the former DDR. Most passengers are worked by DMUs but there are a handful of through trains to Praha, hauled by ALEX class 223 diesels and a number of freights hauled by ex-DR class 232 locos. The Nürnberg - Passau line is a busy, double-track electrified railway and part of the principal route linking northern Germany with central and eastern Austria. The line sees heavy freight traffic as well as regional and long distance passenger trains. The Augsburg - Nürnberg line is an important electrified, double track link between southern and northern Bavaria and is busy with a variety of traffic including long-distance and regional passengers and freights. The Landshut - Regensburg route is fairly unremarkable itself, running through some of the flatter parts of Bayern. There are a a handful of nice locations but it was the ALEX class 183s, only used between München and Regensburg, that attracted me to the line. There were DB Class 111s on REs and some freight as well. Mühldorf lies at the centre of a network of diesel worked lines east of München. The München line sees a lot of loco hauled passengers but the others are worked by DMUs. The attreaction used to be heavy freights serving chemical works in the area and semaphore signals. In late 2010 an influx of class 266s eradicated most of the interesting locos and many of the semaphores were replaced. The line from München to Salzburg and Küfstein is a busy, electrified, double track, international route carrying a wide variety of passenger and freight trains including Austrian Korridorzüge taking a shortcut across German territory between Salzburg and Kufstein. The landscape is pleasant rather than spectacular but there are plenty of good photo positions, particularly south and east of Rosenheim. The Mittenwaldbahn is a scenic single track line linking München with Mittenwald, on the Austrian border. The line south from Mittenwald to Innsbruck is more commonly referred to as the Karwendelbahn. Passenger services were worked by class 111 electrics for many years until EMUs replaced them at the end of 2013. These photos date from October 2013 when the 111s were still in charge. The Allgäubahn is one of Germany's most photogenic lines, running through the rolling hills of southern Bayern and skirting the Alps along the Austrian border. It's lost its importance as a through route in recent years but still sees loco hauled passenger trains and occasionally hosts trains diverted from parallel routes. The König Ludwig Bahn is a 30km branch running south from Biessenhofen on the Allgäubahn to Füssen, a picturesque town on the Austrian border, famous for it's castles and mediaeval buildings. This is a passenger line with most trains worked by class 218s on push-pull sets. The Ingolstadt - Treuchtlingen line runs through Altmühltal, a beautiful winding valley cut into the limestone hills of Oberbayern. The line is no longer used by express passenger trains but now serves as the principal freight route from München to northern Germany and has a loco hauled local passenger service. München is Germany’s third largest city and one of the country's principal railway hubs. The Hauptbahnhof sees plenty of international, domestic long distance and regional passenger services. Several different classes of diesel and electric locomotives are regular visitors to the station including those of independent operators and ÖBB. The Wismut Werkbahn is an industrial line that used to serve the uranium mines around Ronneburg, near Gera in the former East Germany. Its main function now is transporting materials for use in the environmental restoration of the former mining sites. The line is over 20km long and takes sand from a loading point at Kayna, north of Ronneburg, to the old mining sites south of the town. Motive power is provided by a fleet of V300 diesels, ex-DB class 232s rebuilt with Caterpillar engines and painted green. Class 099 covers all the narrow gauge steam locomotives operated by DR and DB, on metre and 750mm gauges. A significant number of steam locos survived in the former DDR until re-unification when the lines they worked became tourist attractions. Most of the locos in use today are 2-10-2 tanks but more exotic types also survive including 0-4-4-0T Mallets and Saxon-Meyers. Class 101 is DB's standard express passenger electric loco, introduced in the mid 1990s and in widespread use all over Germany, often on push-pull sets. These 220km/h 6400kW machines are 15kV only, so generally don't stray far from home rails, apart from trips to Graz and Klagenfurt in Austria. For a flagship locomotive they're remarkably unstylish compared with their class 120 and 103 predecessors. DB's class 103s are, in many people's eyes, the ultimate electric locomotives, capable of 200km/h and with an hourly rating of over 10400kW/13900HP. They powered the InterCity revolution of the '70s and '80s but were becoming expensive to operate by the late '90s. All were withdrawn by late 2002. Remarkably, four returned to front line use in 2013 when problems with ICE sets caused a locomotive shortage. These locos are all variants of class 110, introduced in 1956 and DB's standard express passenger loco for several decades. Gradually transferred to regional services, most of the class have now been withdrawn but a few remain in service, most visibly working InterCity trains on the scenic Gäubahn between Stuttgart and Singen. DB's Class 111 was 15kV express passenger locomotive introduced in 1974. It incorporated a number of design improvements over the preceding class 110 including new cabs, bogies and thyristor control. Over the years the locos lost their express work and became the mainstay of regional passenger services in many parts of Germany. Now they are being replaced by new EMUs and withdrawals have started. DB's class 120, introduced in 1987, was one of the world's first large scale applications of modern 3-phase inverter drives to rail traction. The class now plays a secondary role to the more modern and much less attractive class 101s, working some of the less prestigious InterCity services and, more recently, a number of regional workings. Class 140 and the similar class 139 were West Germany's standard electric freight loco from the late 1950s to the late 1990s but very few remain in service in the second decade of the 21st century. DB inherited over 800 of these 1980s built medium power Bo-Bo electrics from DR at reunification and soon put them to work on regional passenger services all over Germany. The class is now being withdrawn and replaced by new EMUs but a large number remain in service. Class 145 was the first version of the Bombardier Traxx to be bought by DB and is a 15kV only electric freight locomotive. Only 80 went to DB before they switched to the dual voltage version that became Class 185. The independent sector also acquired around 20 class 145s. Class 146 is the single-voltage passenger version of the Bombardier Traxx electric locomotive and DB have over 150 with more on order. They're often found coupled to double-deck push-pull sets on longer distance regional duties. Class 151 was DBs standard heavy freight locomotive until the introduction of machines with inverter drives at the end of the 1990s. Introduced in 1973, the 151 was the first German class with thyristor control and with a 6400kW/8500HP rating it was a formidable machine. The 151s are no longer Germany's premier freight locomotives but can still be seen at work on many parts of the network. Class 152 was Siemens answer to DB's requirement for a modern powerful 15kV freight loco and 170 were built between 1997 and 2001. The class can be seen on electrified main lines all over Germany. DB inherited over 200 class 155 electrics Co-Co freight electrics from DR after re-unification. They date back to the mid 1970s and were equipped with thyristor control, which was state of the art at the time. The class can be seen on electrified main lines all over Germany. 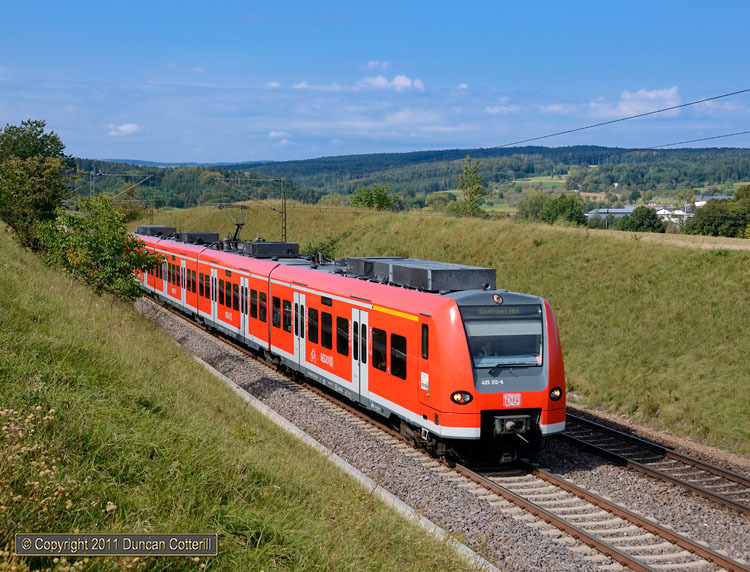 DB's class 180 electrics and their Czech class 371 and 372 cousins are dual voltage 15kV AC/3kV DC versions of the standard Czechoslovakian electric designs of the 1980s and were built by Skoda. Classes 372 and 180 are virtually identical with class 371 being geared for a higher maximum speed. Since my visits in 2010 DB have withdrawn the class 180s but the CD locos remain in service. DB's dual voltage 15kV/25kV class 181s were built in the 1970s to operate services across the border into France and Luxembourg. In recent years they've lost a lot of their traditional duties but around eight of the original 25 remain in service on InterCity and overnight passengers, some of which require their dual-voltage capabilities but many that don't. Classes 182 and 183 cover 15kV/25kV and 4-voltage variants of the Siemens Taurus, respectively. Class 182 has proven popular with independents and a handful of class 183 are also registered in Germany. DB even has 25 182s and hires in more. Visiting foreign Taurii, such as Austrian locos of classes 1016, 1116 and 1216 are also included here. The Bombardier TRAXX is probably the most successful electric locomotive of the early 21st century and the dual voltage class 185 is its most numerous variant. It's a 15kV/25kV 5600kW Bo-Bo with a maximum speed of 140km/h intended for freight haulage and DB has around 400 of them. The 185 is also popular with the independent sector and can be seen all over Germany and in many surrounding countries as well. Class 186 is the multi-system variant of the Bombardier TRAXX family, differing from the class 185 by being equipped to operate from 3000V DC and in most cases also 1500V DC overhead. These locos are popular with the independent sector, particularly operators running trains between Germany and Italy. The Class 187 is the AC3 version of Bombardier's Traxx family, introduced in 2012 as the successor to the ubiquitous Class 185. The 187 has a modified cab design, making it easily identifiable, but the most significant change is the option for a small "last mile" diesel engine to be fitted, allowing it to operate away from the electrified network. Class 189 is a development of the Siemens built class 152 equipped for operation under all four major European electrification systems, 1500V DC, 3000V DC, 15kV AC and 25kV AC, potentially allowing operation in countries the ubiquitous class 185 can't reach. DB has a fleet of 90 locos and others are in service with the independent sector in Germany and elsewhere in europe. Class 201 was the original DR V100 design dating from 1966 while classes 202 to 204, 293 and 298 are all variations, usually rebuilds with more powerful engines. In total over 1000 were built for DR, industrial users and export. DB retain a number for departmental duties while independent freight operators and infrastructure companies use many more. These locos are variants of the DB V100 design dating from the late 1950s. The original locos became class 211. Class 212 was a more powerful version, while the ten class 213s were 212s equipped for very steeply graded lines. Over 740 V100s were built but only a handful remain in departmental service with DB, while others are operated by preservation and independent sectors. Class 214 are Althom rebuilds using only the frames, bogies and transmissions of the original locos. DB's Class 215 was an intermediate design, essentially a class 216 in the body of a class 218. Introduced in 1968, 150 of these medium-power diesel-hydraulic B-Bs were built and saw use on passenger and freight duties for many years. Class 225 comprises class 215 locos with steam heating boilers removed . A few early class 218s in freight service also carry 225.8xx numbers. A few 225s remain in service. Class 217 was introduced in 1965 and was a development of the class 216 with a separate diesel generator to provide electric train heating. A total of 15 were built and despite having ETH, they spent most of their lives working freight trains, latterly around Mühldorf, where they were displaced by class 266 in late 2010. The last 217 was withdrawn in December 2011. DB's class 218 is the final iteration of the single-engined B-B diesel-hydraulic design that started with the class 216 in 1960. Class 218 was introduced in 1968 and eventually totalled 399 locos, powered by a variety of diesel engines producing between 2500 and 3000 horsepower. They worked in most parts of Germany and can still be found on the few InterCity and regional passenger services that require diesel haulage.. The Siemens ER20 EuroRunner diesel is probably best known as ÖBB class 2016 but a significant number are also based in Germany, where they were originally class 253, later changed to class 223. The locos are popular with independent operators and can be found on NOB services from Hamburg and ALEX services from München and Regensburg. MRCE Dispolok also operates a sizeable fleet of hire locos. DB inherited around 700 of these Soviet built diesel electric Co-Cos from DR after reunification and put them to work all over Germany, particularly on heavy freight trains. The concentration of freight onto electrified lines and the introduction of new classes has reduced their use considerably but they still have some regular duties and are favourites for diversions and other short term requirements. Twelve powerful Co-Co diesel electrics were built by MaK, by then part of Siemens, for Norway in the mid 1990s but were plagued with faults and rejected by NSB. Taken back to Germany and extensively rebuilt, many have ended up working for NOB (Nord-Ostsee Bahn) on passenger services between Hamburg and Westerland. Officially they are class 251 but are also numbered by NOB as class DE2700. You can't get away from them, class 66s are everywhere, including in Germany. Many work for independent operators but DB also has a sizeable fleet. Conveniently they've been classed as 266s by the authorities although DB, for reasons best known to itself, calls them 247s. Vossloh's G2000 is a compact high power B-B diesel-hydraulic introduced in 2000 and classed 272 in Germany. It hasn't proved very popular with operators with less than 70 locomotives sold to freight operators and infrastructure companies. Classes 290 and 291 are heavy shunting locos built for DB in the 1960s and 1970s. Many have been rebuilt with remote control becoming classes 296 and 295 respectively. Rebuilds with new engines and remote control gear became class 294. Some have been sold to independent operators but many remain on shunting and local freight duties with DB although new class 261s are starting to displace them. Class 401 units were introduced in 1989 and were the original ICE high speed EMUs, capable of 280km/h and usually formed of two power cars and 12 trailers. Class 402 followed a few years later with a single power car, 6 trailers and a driving trailer. Both classes are still in front-line service on many of the main InterCity routes but not the steeply graded Köln - Frankfurt NBS. Tilting class 411 and 415 ICEs are used on routes that include severe curvature on some sections but would also benefit from high speed running. In appearance they are very similar to the very high speed non-tilting ICE3 (class 403) but are limited to 230km/h. The 4-car class 424 and 425 and 2-car class 426 articulated EMUs were introduced in 1998-9 for regional services and can be found in many parts of Germany. Classes 427 and 428 are the three and four car versions of the very successful Stadler Flirt design and are popular with independent regional operators in Germany. Alstom's Coradia Continental articulated EMUs are Class 440 in the German numbering system and operated by DB and a number of independents including NordWestBahn and Agilis. Hamburg's S-Bahn is a bit more interesting than most as it's electrified at 1200V DC with bottom-contact third-rail. The system has its own dedicated fleet of 3-car EMUs of different designs to the usual S-Bahn fare. Most services are operated by class 474s, the more modern and more attractive of the two designs in use.. The 20 2-car units of class 610 were introduced in 1992 and were DB's first tilting DMUs, built by a consortium of German builders. The 610s used the proven FIAT Pendolino hydraulic tilt system and were unusual in having underfloor engines combined with 3-phase electric transmission. The units spent their lives on the diesel worked lines north-east of Nürnberg where they clocked up an average of around 5 million km each before being withdrawn as non-standard at the end of 2014. DB's 2-car class 611 tilting DMUs were supposed to be an all-German equivalent of the 610 with air-conditioning, an electric tilt mechanism and hydraulic transmission. Introduced in 1996, they've had numerous problems and are likely to be replaced by class 612 units over the next few years. All 50 sets are based at Ulm and used on RE and RB services on non-electrified routes in Baden-Württemberg. The class 612 2-car tilting DMU is a development of the troublesome class 611 and have been reasonably successful, apart from some problems with cracked wheelsets, and around 190 are in traffic with DB Regio. The units are in widespread use on Regio-Express services on un-electrified secondary main lines, particularly in Bayern and Sachsen but less common in Baden-Württemburg and in northern Germany. The class 628 2-car DMU was introduced in 1974 as a prototype but it was over a decade before a much modified version went into series production in 1987. Over 400 units of classes 628.2 and 628.4 were built over the next decade and they can be found on local services all over Germany. Several units were bought new or acquired second-hand by other operators. The class 642 is a lightweight articulated 2-car articulated DMU from the Siemens Desiro range. DB have over 230 642s and they're also popular with independent operators. Although designed for lightly trafficked branch lines, they seem equally at home on main line stopping services and can be found in many parts of Germany and in several other European countries. The class 648 DMU is a lightweight articulated 2-car unit, designed by Linke-Hofmann-Busch but now built by Alsthom as the Coradia LINT 41 after the French company took over LHB. 648s are in widespread use with DB and independent operators and can be found in many parts of Germany on branch line and main line stopping services. The class 650 single unit was introduced in 1996 and originally produced by ADtranz at the former DWM plant in Berlin. In 2001 the factory was sold to Stadler and production continued under the auspices of the Swiss company. The 650s are popular in Germany, with DB and the independent sector operating over 450 units. The ÖBB class 2143 and the similar class 2043 were the standard Austrian main line diesels of the 1960s and 1970s. A number were sold to independent operators including two to Augsburg based SVG when ÖBB no longer needed them. The SVG engines have been hired by ALEX to work the Oberstdorf - Immenstadt shuttles on a number of occasions. Agilis operates local passenger services on a number of lines in north-east Bayern, using Class 440 EMUs on lines from Regensburg and Class 650 DMUs around Hof, Marktredwitz and Bayreuth. ALEX started life in 2002 as the Allgäu Express, operating fast trains between München and Oberstdorf. In late 2007 the franchise was expanded to include München - Lindau and München - Hof services and, from 2010, some cross-border services to Plzen. ALEX uses class 223 diesels and class 183 electrics on its trains. Cantus is a joint venture between the Hamburger Hochbahn and Hessische Landesbahn and had operated local passenger services around Kassel using 3-car class 427 and 4-car class 428 Stadler Flirt articulated EMUs since the end of 2006. Captrain's origins were were in Rail4Chem, an independent operator set up by and for the chemical industry in 2000. Rail4Chem was bought by Veolia in 2008 and in 2009 passed to SNCF and was grouped with it's other German operations as Captrain Deutschland. Crossrail is a private freight operator that specialises in long distance traffic between the low countries and Italy via Germany and Switzerland. The company has a significant presence in Germany and its locos are a common sight on German main lines. DB or Die Bahn, formerly Deutsche Bundesbahn, is Germany's state railway and operates passenger and freight trains across Germany. Many regional passenger services have been taken over by other operators and independents are also very active in the freight sector. However, DB is the biggest presence by far with a massive and varied fleet of diesel and electric locos and multiple units. Lokomotion is an open access freight operator specialising in routes between southern Germany and Italy or Slovenia via the Brenner and Tauern routes. It operates a fleet of modern electric locomotives of classes 185, 186 and 189 as well as some older ex DB electrics of classes 139 and 151 and a single class 212 diesel. MRCE Dispolok is one of Europe's largest locomotive hire companies with a fleet of over 130 modern diesel and electric locomotives, most of them registered in Germany. Dispoloks can be seen all over Germany on freights and on a number of passenger services operated by DB and the independent sector. The Nord-Ostsee Bahn or NOB operates regional services between Hamburg and Westerland with a fleet of class 223 and 251 diesels working push-pull equipment. It also operates a few trains between Itzehoe and Heide or Husum with DMUs but the vast majority of services are loco hauled. The locomotives of ÖBB (Österreichische Bundesbahnen), the Austrian state operator, are a common sight on Germany's electrified main lines. Class 1016 and 1116 electrics are booked to work passenger trains as far north as Hamburg and appear on freights on many parts of the network. Other classes can appear as well but are fairly uncommon these days. Press is an offshoot of the Pressnitztalbahn, a preserved 760mm gauge line. It owns, operates and hires out an interesting fleet of standard gauge diesels and electrics including some vintage machines. Railpool is one of the larger German locomotive leasing companies with a fleet of modern Bombardier Traxx and Siemens Vectron locomotives equipped for operation over much of the european network. Many of its locos carry a distinctive silver and blue livery but others are painted in the colours of their operators. RTS is an Austrian based freight operator owned by the Swietelsky construction company and it's rail operations are closely linked to infrastructure projects in Germany and Austria although it does handle other freight work as well. SBB Cargo is the freight arm of the Swiss national operator and operates in Germany as SBB Cargo Deutschland. A number of SBB Cargo electrics are also hired to German independent operators and can appear anywhere on the electrified network. Class 482 electrics, similar to DB class 185, are the most visible type although class 421 (Re4/4ii equipped for operation in Germany) also appear. SVG started as a preservation operation based on the Staudenbahn, a closed line near Augsburg but has expanded into the loco hire business. SVG's ex ÖBB class 2143 diesels have been used on ALEX passenger services and they also have an ex ÖBB class 1142 electric available. The Vogtlandbahn started operating in 1994, running local passenger services in the Vogtland area of Sachsen and has expanded since to neighbouring areas of Thüringen and Bayern. It also operates across the border into the Czech Republic on several routes. Vogtlandbahn services are operated by DMUs but the company also operates loco hauled services under the ALEX brand. Germany is one of the few countries to persevere with large diesel-hydraulic locomotives although diesel-electrics are also in widespread use. DB operates a sizeable fleet of both types including class 218 D-H and class 232 D-E machines. The independent sector uses a wide variety of locos including modern designs from Siemens and Vossloh and a few foreign classes such as Danish MYs and Austrian 2143s. Germany was a pioneer of 15kV 16.7Hz AC electrification in the early 20th Century and the electrified network now covers virtually all major routes and many secondary lines as well. 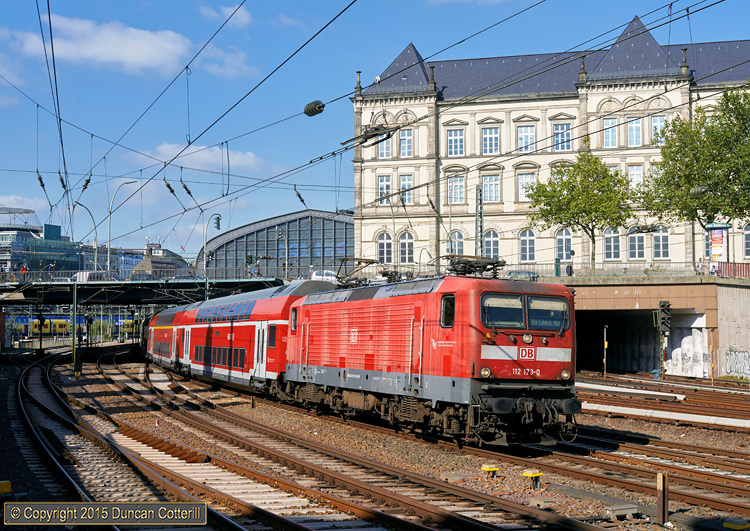 A wide variety of electric locomotives, ancient and modern, are in use with DB and independent operators and can be seen on freights, regional and long-distance passenger trains all over the country. There have been diesel railcars in Germany for many years but DMUs didn't really take off until the end of the 20th Century. Now they're everywhere. From rural branchlines to long cross country routes between major cities like Dresden and Nürnberg, DMUs rule the rails, away from the wires at least. There are even diesel versions of the flagship ICE trains. Germany was a pioneer of electric railcars and EMUs at the turn of the 20th Century and is now home to a huge variety of designs operating all types of train. These range from tram type vehicles trundling along rural branchlines to the high capacity S-Bahn EMUs that keep the cities moving and the ICEs speeding between them at 300km/h. Germany has a flourishing independent rail freight sector and competition has encouraged DB to sharpen it's act, resulting in more traffic for the state operator as well. The vast majority of freight runs on electrified lines but I've made a point of seeking out the best diesel freight workings so the content of this gallery doesn't give a true impression of the relative proportions handled by each type of traction. Germany still has quite a lot of locomotive hauled passenger trains although DMUs and EMUs are rapidly taking over all types of service. Although the majority of loco-hauled services are operated by DB, the independent sector has a few high profile regional operations including NOB services from Hamburg and ALEX services from München and Regensburg. The Sylt Shuttle is a DB Autozug car carrying operation linking the island of Sylt with the mainland via the Hindenburgdamm. It's a bit like the Channel Tunnel but with no tunnel and diesel haulage. Trains run as frequently as half hourly, carrying all types of road vehicle from articulated lorries to cars and motorbikes. Germany has a large number of independent railway operators, some large international companies or foreign state operators, others small niche operators or preservation groups with one or two locos for hire. It all makes for a vibrant scene with plenty of variety of diesel and electric loco types and liveries working both passenger and freight trains all over Germany. Germany sees a lot of foreign locos on its railways, partly because it has land borders with no fewer than nine other countries and partly because independent operators have found it easier to acquire second hand locos abroad than from DB, their main competitor.